Brewed with oats and PA wildflower honey and hopped with Mosaic, Amarillo, and a bit of Simcoe. Can dated 10/25/18. Poured into tulip. Look is pale golden haze with a fluffy white head. Nose is big fruity hops, with notes of tropical fruit, mostly pineapple and mango if I had to choose, plus lemon rind leading the way, along with some berry in the background. Taste starts with the tropical notes up front before adding in the lemon rind in the middle, then a bit of earthiness comes up as well toward the end before a semi bitter and dry finish, lingering light earthiness and lemon rind. Mouthfeel is light feeling but not thin, more fluffy as is typical of lots of tired hands IPAs in my experience. Overall nice light, fluffy, and dry IPA. Not a huge fan of earthy hop character in general but I think it works as well as possible here with the dryness and fruit forward nose. 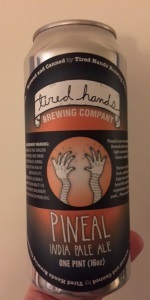 Had this on 2018-07-07 at their Fermataria brewery and again on 2018-08-04 from a 16oz canned on 2018-06-28. On 2018-12-03 I had a can from this past June that's been in my fridge the whole time. It's held up very well and I'm enjoying it. T - Pineapple, biscuit, apricot, earthy spice, pine, a taste of honey and mild-moderate hop bud dankness. Nice orange zest bitterness in the finish, which lingers pleasantly. M - Medium body and carbonation. Soft at first then a little prickly in the drying finish. Really nice feel. O - My kind of hazy IPA, which is juicy but the pine, citrus and reasonable bitterness are still there ala a West Coast IPA. Good stuff on draft and from the can. Really nice light IPA, crisp and refreshing, honey comes through nicely. Almost a session IPA.